Tutorial 1. Types of Leather. Choosing the Right Leather and Calculating its Consumption. Tutorial 2. Additional Tools and Materials. Tutorial 3. Calculating Leather Consumption and Preparing the Patterns. Tutorial 4. Duplicating Leather with Iron-On Batiste. Tutorial 5. 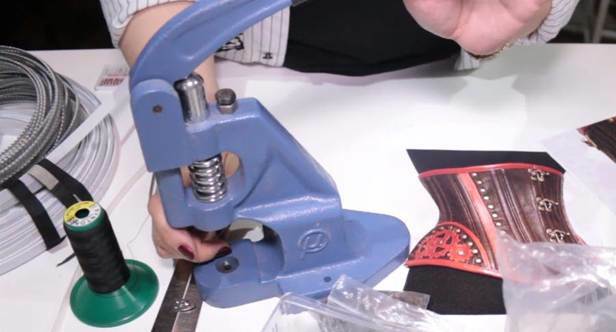 Cutting All Parts of the Corset. Tutorial 6. Additional Tools for Sewing with Leather. Tutorial 7. Assembling the Face of the Corset. Opening the Seam Allowances of the Corset. Tutorial 8. Cutting the Busk. Marking Sewing Lines for the Busk. Tutorial 9. 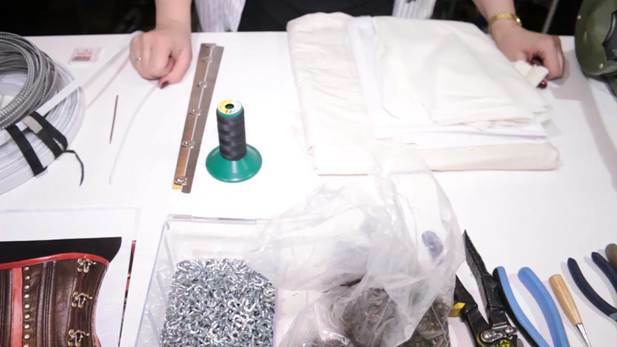 Assembling the Bars for Concealed Busk Fastener. Tutorial 10. Stitching Around the Busk. Adding a Ceinture to the Lining. Tutorial 11. Joining the Face of the Corset with the Lining. Basting Topstitching Guidelines. Tutorial 12. Topstitching the Seams. Sewing Tunnels and Lacing Bars. Tutorial 13. Cutting Appliqué Motifs. Tutorial 14. Sewing Decorative Boning Tunnels. Tutorial 15. Applying Appliqué Motifs and Decorative Plackets. Tutorial 16. Sewing the Appliqué Motifs on the Lay-On Elements. Tutorial 17. Finishing the Top Edge with Bias Tape. Tutorial 18. Marking the Placement of Garment Accessories. Tutorial 19. Installing Grommets and Rivets. Stitching and Trimming the Bias Tapes. Tutorial 20. Cutting Flat Steels and Spirals. Inserting Bones in the Corset. Tutorial 21. Sewing the Lay-On Elements on the Corset. Marking and Installing Rivets. Tutorial 22. Finishing the Bottom Edge of the Corset. Tutorial 23. Preparing a Modesty Panel. Tutorial 24. Sewing the Modesty Panel in Place. Lacing the Corset. Tutorial 25. Gluing the Lay-On Elements on the Corset. Tutorial 26. Stitching a Border for the Latches. Detailed review of different leather types and their qualities. The differences in working with leather from working with fabrics. I would like to talk about certain materials which I always use in corset-making. Iron-on fabric is a must because a corset is supposed to shape the body and, therefore, not supposed to stretch out. Leather should be duplicated with special low-temperature iron-on fabric which can be fused on with the iron set to "silk" or "wool" (no steam). I use woven interfacing as duplication fabric. Since it is rather thin, I duplicate each piece of leather twice and in the opposite directions. Sometimes I also use low-temperature iron-on muslin, which I either apply with a household iron or with a warm press-iron. I put the muslin down with its least stretchy grain horizontally to prevent the corset from stretching widthwise. As for the lining, I prefer to sew it with natural cotton materials. I set the iron to strong steam and decatize the fabric in advance to prevent the lining from shrinking later. Rivets. They are made from two parts: the cap and the post. I use double cap rivets for thick-leather corsets to protect the wearer's skin from sharp edges. If you need to carry out a fitting, simply snap the caps of rivets on the posts without actually pressing them closed. I will also use brass grommets and washers in the lacing bars. I will add a double fastener to the corset to make sure it can handle strong tightening: there will be busks on the inside and decorative swing-arm latches on the outside (I will install the latter at the very last moment). I will use stainless steel uncoated busks. All these elements are set with the help of a hand-press tool and special accessories. I will also use revolving punch pliers to punch holes for setting rivets and grommets. It is best to make smaller holes and then broaden them with an awl to make sure your rivets and grommets will sit safely in the leather. I use tin snips for cutting busks. Please look at these two closely-spaced loops at the bottom of the busk. Make sure to cut the busk from the opposite end to preserve this pair of loops and posts (they will be placed at the level of the stomach). When cutting the busk, remember that it is not supposed to get into the seam. I only use steel bones for hard corsets. Preferably those made in Germany. My favourite choice is 8mm steel bones. Sometimes I also use 4-5mm bones: when sewing for a really thin girl or with very thin leather, for example. As for whalebone and plastic bones, I use them very seldom and only in those cases when minor tightening is enough. I cut steel boning with side cutters and put special steel caps on their ends. I use flat steels with plastic casing on lacing bars. With these bones, your lacing bars won't bend and buckle. I round off the ends of flat bones and file them smooth on a bench-grinder. Working with leather is technically different from working with fabric: you can neither pin pieces together, nor baste them, nor even press your seams. You need to use other methods instead. I use a rubber-based adhesive to temporarily secure leather pieces together and prevent their seam allowances from shifting against each other. In most cases, you can easily separate the pieces without any damage after the adhesive dries out. And I use rapid glue to secure the seam allowances together for good. I pound seam allowances using either a shoe mallet or a silicone mallet that doesn't leave marks on leather. Working with leather also requires extra robust sewing thread. I use Synton polyester thread No. 60 by Amann. It is very durable and I don't have to worry about any seams coming undone. Sheepskin corsets are sewn with needles No.90/14 and 100/16. I recommend using special needles with sharp triangular points for thicker types of leather. A silver leather marking pen is another necessary tool. 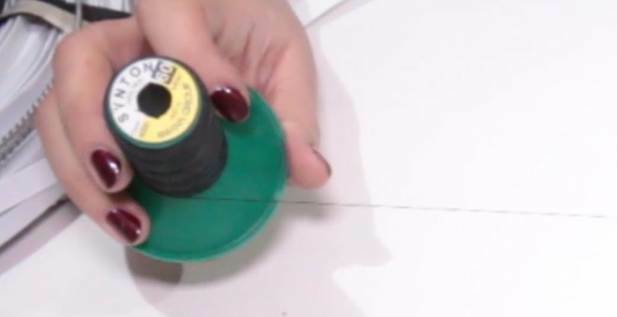 Markings made with a pen like this can be easily wiped off with petroleum jelly or silicone-based machine oil. But, of course, it does not mean you should make markings all over your leather.